Dedicated to Lord Jagannath or Lord Krishna, the Jagannath Temple in Puri in Orissa is a very famous Hindu temple. The temple is an important pilgrimage for many Hindu traditions in which Lord Vishnu and Lord Krishna are worshipped. This temple is very famous for its Rath Yatra or the Chariot festival when huge chariots carrying the deities go and travel. Three deities, Jagannath, Balabhadra, and goddess Subhadra are placed bejeweled in the inner sanctum of the temple. The temple complex covers around 120 temples and shrines. 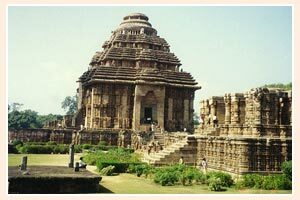 Jagannath Temple is one of the most magnificent monuments that exist in India. The kitchen of the temple is considered to be the largest in India where offerings are prepared to offer to thousands of visitors who throng the temple.